Here are some frequently asked questions, with hopefully some answers! If you have any questions send them in and I'll see if I can get you an answer! Send your questions to liane@jonathancreek.net. Is Jonathan Creek available to buy on DVD/video? When is the next series of Jonathan Creek due to air? Are the variations on Danse Macarbe used in the theme tune available to buy? Is Jonathan Creek available to buy as a book? I want to write to the cast, Where do I write to? Where has Jonathan Creek been shown in the world? Where is Jonathan Creek's Windmill? Why were the first season episodes cut outside the UK? Can I buy any videos of Alan's stand-up tours? What was the answer to the Jonathan Creek Book Mystery? 1. Is Jonathan Creek available to buy on DVD/video? Yes it is! Please see the merchandise page for details of what is available. 2. Who writes these pages? Liane has been lucky enough to be an extra in Jonathan Creek and can be seen in the episode The Eyes of Tiresias (if you know where to look and don't blink! Read Extra extra, Creek all about it for more info and a picture) and the 2008 Christmas special, The Grinning Man where she can be seen taking a baby from Candy Mountains. In 1999 she gave a number of interviews on BBC local radio about Jonathan Creek. 3. When is the next series of Jonathan Creek due to air? A new feature length special is due for Easter 2010. 4. Are the variations on Danse Macarbe used in the theme tune available to buy? You can probably buy the original piece of music in any good music shop. However the variations are not yet available to buy (please let me know if you know differently!). For those that can't wait that long, here is the opening and closing theme tune as an MP3. 5. Is Jonathan Creek available to buy as a book? Yes. A book called The world of Jonathan Creek was published in October 1999 and has an ISBN of 0-563-55135-6. It contains information on the first three seasons as well as behind the scenes info and profiles on the actors. Please see the merchandise page if you want to buy a copy. 6. I want to write to the cast, Where do I write to? You can write to any member of the cast as well as the writer David Renwick c/o of the BBC using the following address. Alternatively you can write to Caroline Quentin, Alan Davies or Julia Sawalha c/o their respective agents. You can find the appropriate addresses on the Actor Profile pages. 7. Where has Jonathan Creek been shown in the world? Jonathan Creek has been shown in the following countries abroad (i.e. outside the UK). Alas I don't know everyone's details, like which stations were showing it etc. So if you live in one of these countries, I'd be grateful if you drop me a line and let me know! Also if your country isn't listed here and you've seen Jonathan Creek, let me know! 8. Where is Jonathan Creek's Windmill? Jonathan's Windmill is located in Shipley, West Sussex, about 6 or 7 miles south of Horsham in the UK. The windmill is open to the public, but all of that lovely magic memorabilia that Jonathan owns will not be there. John Asbridge, Jonathan Creek's designer, brings it all with him for filming, and then takes it back for storage when they finish. 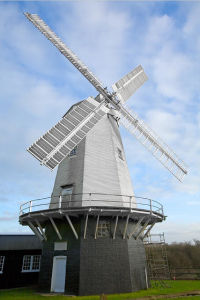 Built in 1879, it's billed as the Best working Smock Mill in West Sussex, and was once owned by Hilaire Belloc. Sadly it is no longer open to visitors, but you can see it externally from the adjacent footpath. For more info about the mill visit its official website at: www.shipleywindmill.org.uk. The photograph of the mill seen right was taken by Adrian G Pop, and is used here with kind permission. 9. Why were the first season episodes cut outside the UK? David Renwick himself gave a reply to this question, "When I first wrote the series I began with a ninety minute opener and followed it with five hour long episodes. For reasons which have never been clear Alan Yentob, then Controller of BBC 1, actually commissioned one- plus-four, which meant that after the first series we had a script left over. Sixty minute programmes are very hard to sell to commercial stations where advert breaks have to be fitted in, so we had to re-package the five UK shows into six shows for BBC Worldwide. This meant splitting The Wrestler's Tomb into two parts and cutting down the other four episodes from 60 to 50 minutes. Inevitably this tended to mean losing the comedy, or "fun" moments, because it was very difficult to tamper with the mystery elements of the plot. So my apologies to viewers abroad who have missed out on certain entertaining bits that were shown over here." 10. Can I buy any videos of Alan's stand-up tours? Yes you can! Please see the merchandise page for details. 11. What was the answer to the Jonathan Creek Book Mystery? "Don't tell me, the butler did it?" Maddy slumps into the chair opposite. "Sorry, couldn't resist. Go on then...astound me!" "What you said last night, started the ball rolling..."
"Well that's just it, the room wasn't locked." "So, its conceivable someone could've hidden behind one of the speakers, shot Cain and slipped out, while spelling was turning the projector off." "Slipped out! The killer would've been trapped." "Not necessarily. Spelling said he was able to open the door enough to feel for a pulse." "Yeah, but Larry the Lamb yesterday said '...no man or woman could've possibly escaped." "Come on," Jonathan exasperates, "Not a man or a woman, but a..."
"Oh, you are kidding. Jonathan she was only six years old! Why?" "Why is what's keeping me up all night, and I could only come up with one possible reason. You read all this stuff, it didn't need to stop at Wives and Secretaries." Maddy hesitates. "Mmm, I see your point, Marcey's hardly going to make a film about how she killed her abusive stepfather?"